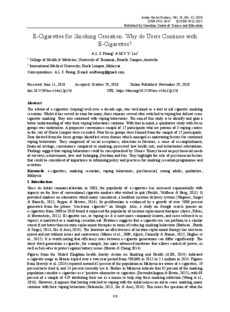 eCite - E-cigarettes for smoking cessation: why do users continue with e-cigarettes? E-cigarettes for smoking cessation: why do users continue with e-cigarettes? The advent of e-cigarettes (vaping) well over a decade ago, was welcomed as a tool to aid cigarette smoking cessation. Whilst it has served its aims for many, there remains several who switched to vaping but did not cease cigarette smoking. They also continued with vaping behaviours. The aim of this study is to identify and gain a better understanding of why their vaping behaviours continue. With that in mind, a qualitative study with focus groups was undertaken. A purposive convenience sample of 17 participants who are patrons of 3 vaping centres in the city of Kuala Lumpur were recruited. Four focus groups were formed from the sample of 17 participants. Data derived from the focus groups identified seven themes which emerged as motivating factors for continued vaping behaviours. They comprised of social acceptance; attraction to flavours; a sense of accomplishment; financial savings; convenience compared to smoking; perceived low health risk; and behavioural substitution. Findings suggest that vaping behaviours could be conceptualised by Choice Theory based on psychosocial needs of survival, achievement, love and belonging, freedom and fun. They highlight the role of psychosocial factors that could be considered of importance in informing policy and practices for smoking cessation programmes and activities.